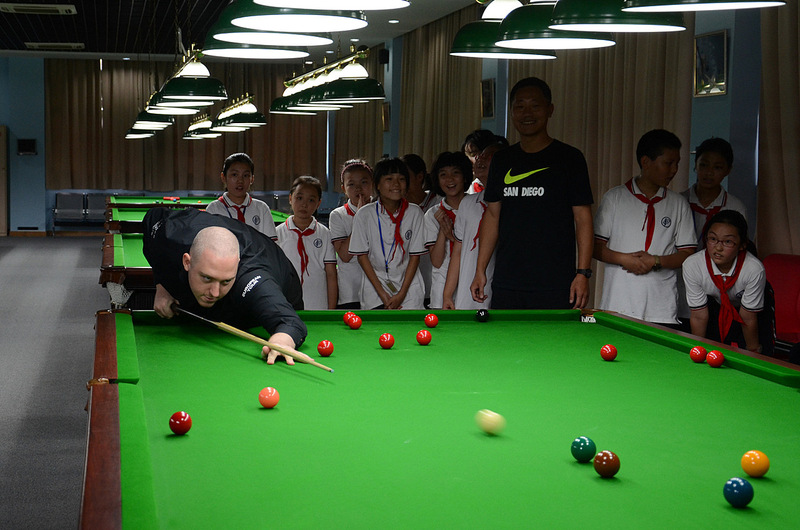 Kyren Wilson and David Grace visited aspiring young snooker players at Shanghai Huimin Middle School earlier this week. Wilson and Grace, who are both competing in the last 16 of the Bank of Communuications Shanghai Masters today, met children at the school and gave them tips on improving their snooker skills. WPBSA Chairman Jason Ferguson, WPBSA director Nigel Mawer and World Snooker directors Steve Dawson and Miles Pearce also joined the trip. Ferguson said: “It is always fascinating to visit schools here and to and see the level of enthusiasm for snooker. Alongside the CBSA we are working to provide a bright future for our sport in China. “The sheer number of young people playing snooker here and the level of talent is astonishing. This was highlighted by the fact that this year’s World Cup in Wuxi was won by two Chinese players aged 15 and 17. “Snooker also helps build mathematics and social skills for children, which is why our CueZone Into Schools programme has been such a success.